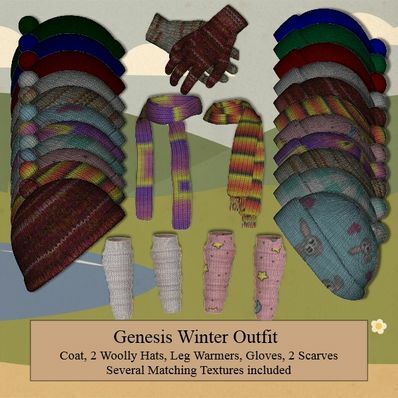 A Winter Outfit for Genesis for use in Daz Studio 4.6. Coat, Two woolly hats, 2 scarfs, leg warmers and gloves. Waist fit morph on coat to fit over skirts and trousers. Thank you very much, how to force resources. Thanks! Wonder if I can convert the gloves to black leather for a Gen2 male hand in an image? Thanks again for the resource! As always such a delight, thank you! !